New York: Quality Paperback Book Club, 1989. This is the Book-of-the-Month Club edition of The Joe Leaphorn Mysteries: Three Classic Hillerman Mysteries Featuring Lt. Joe Leaphorn. 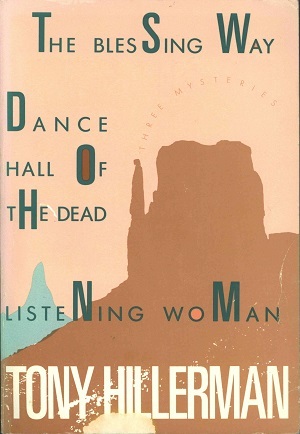 This edition is an anthology of the first three novels from Tony Hillerman's Navajo Mystery Series. This edition was reprinted in 1989 by Quality Paperback Book Club in New York with the permission of Harper & Row, Publishers, INC. This Book-of-the-Month Club edition is a facsimile of the first edition of this anthology and, as this edition was specially printed, the bar code, price, and ISBN number have been removed from the back cover. The colored photograph on the cover featuring a Southwestern vista was taken by Mark Scott and the cover was designed by Sandie Benedicto. Format: Paperback, 20.1 x 13.9 cm. Binding: Multicolored paper covers with the author, book titles, and book club logo printed vertically in mint green on the spine.